Dr. Zhu’s long-term goal is to advance nanoscience and nanotechnology by improving the understanding of nanoscale material behavior. Dr. Zhu teaches Micro/Nano electromechanical Systems (MAE 536) for students interested in the fundamentals and the applications of micro/nano sensors and actuators. His lecture style course includes guest lecturers from industry and academia, and concludes with final projects of teams of 2 to 3 students in which the teams, based on the class material, propose and design micro/nano transducers for their intended applications, and study related scientific issues. Dr. Zhu’s graduate students are self-motivated; they like both experimental and theoretical work, and tend to enjoy intellectually challenging, multi-disciplinary problems. The research they conduct in Dr. Zhu’s lab advances a major engineering frontier that may eventually lead to important new discoveries in the field of nanoscience and nanotechnology. At the undergraduate level, Dr. Zhu teaches Solid Mechanics (MAE 314) and Strength of Mechanical Components (MAE 316). Both of these classes are taught following standard practices but he also includes in his lectures examples taken from his work on nano/micro devices. See also Dr. Zhu’s ResearcherID site and his Google Scholar link below. Outside of work, Dr. Zhu enjoys travel and sports like swimming, basketball, and ping-pong. Dr. Zhu is interested in mEMS/NEMS design, fabrication and characterization; mechanics and materials issues in nanostructures and thin films; and mechanics of soft materials (including polymers and biological cells) and interfaces. 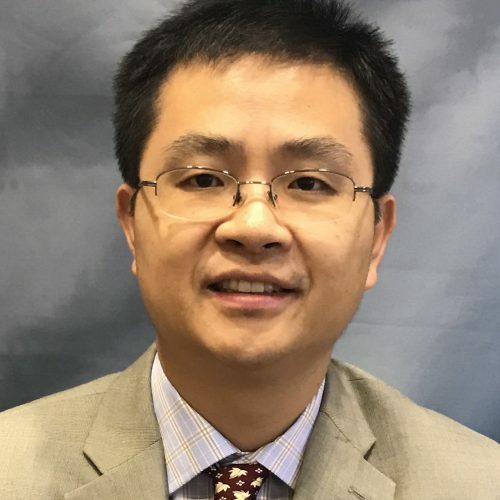 Dr. Zhu is currently 1) developing micro/nano electromechanical transducers (NEMS/MEMS), 2) studying mechanical, electrical, and thermal inter-relations at the nanoscale, and 3) studying mechanical behavior of biological cells, thin films, and adhesion. The objective of this proposal is to develop and utilize novel in situ TEM nano-thermo-mechanical testing and atomistic modeling for elucidating the temperature, strain rate and sample size effects on the strength and brittle-to-ductile transition (BDT) in Si nanowires. While Si nanowires at room temperature have been measured with brittle fracture, our preliminary in situ testing inside transmission electron microscope (TEM) have shown that an increase of temperature can result in a fascinating BDT behavior in Si nanowires by activating the dislocation-mediated plastic deformation. The overarching goal of this project is to fabricate large-area, high-resolution, stretchable pressure sensor arrays for e-skin at low cost by integrating organic semiconductors, AgNW conductors, and elastomers. The devices will be fabricated using several scalable nanomanufacturing techniques including gravure printing, transfer printing, and electrohydrodynamic (EHD) printing. Hand amputation can severely limit the quality of life such as manipulating and sensing objects or expressing gestures. Attempt to replace the lost hand can be traced back 500 years ago, reflecting the strong desire of restoring hand functions. Currently, many robotic prosthetic hands have been developed, that have the dexterity capability approaching a human hand. However, very few state-of-art prosthetic hands have been successfully translated to end users. One key factor that limit the user acceptance is the lack of natural and reliable sensory communication to the user. Specifically, the sensory feedback to the user was substituted through un-natural stimuli, such as skin vibration, visual or audio cues. These stimuli can be implemented readily, but require userâ€™s interpretation and conscious attention, imposing extra cognitive burden to the user. Alternatively, peripheral sensory nerves, transmitting haptic information to the central nervous system, can be activated electrically to provide natural haptic sensation. However, invasive open surgery procedures are typically required to implant electrodes interfacing with the nerves, and the resolution of elicited sensory regions is also typically low. To overcome these limitations, the objective of the current proposed project is to restore natural self-sensation of the missing hand via non-invasive grid electrodes, ultimately allowing arm amputees to explore and communicate with the world freely. The success of this project will completely transform the way for human being to communicate with robotic prostheses. Biomarker-based immunoassays are specific and quantitative; however, they depend on intradermal or subcutaneous extraction of fluid. One of the hurdles to intradermal extraction is the stratum corneum, the uppermost layer of â€œdead skin.â€ A method to bypass the stratum corneum and extract or probe ISF would be an invaluable tool for the development of real-time health monitors. Herein the design, fabrication and evaluation of a nanocellulose-coated microneedle array (NMA) to extract ISF is proposed. The underlying microneedles will be molded from soft, compliant materials and subsequently coated in nanocellulose. The nanocellulose-coating enables the extraction of ISF by capillary force and diffusion; it is also a mechanically tough coating which will protect the soft underlying microneedle and support long-term use. The proposed platform represents the first step towards the realization of a transdermal ISF sensor. Sponsor: Samsung Research America Inc. The objective of this project is to investigate the electromechanical performances of the flexible and stretchable strain sensors under cyclic loading in order to improve the long-term reliability of the sensors. The strain sensors are built using the silver nanowire technology at NCSU. We specifically propose to improve the reliability at the interfaces (e.g., lead wire to the silver nanowires). We will work closely with the team at SRA-Dallas to identify the failure modes. If successful, this project will provide insights into the failure mechanisms of the strain sensors and develop new methods to improve the sensor reliability. A personâ€™s water content is crucial to the body, as it regulates body temperature, blood pressure, heart rate and etc. An accepted way to obtain the body water level is through hydration testing. One common method to characterize skin hydration levels is measuring skin electrical impedance. The objective of this project is to develop wearable sensor system that can continuously monitor skin hydration level. Such continuous monitoring could help prevent the wearer from falling into a severely dehydrated state. A compliant and wearable electrode is the key to continuous hydration monitoring. Extraordinary mechanical, electrical, and thermal properties make carbon nanotubes (CNTs) ideal candidates to reinforce, toughen, and introduce multifunction to composite materials. As a response to this research need, this study proposes a novel, low-cost, continuous processing technique to directly grow CNTs on carbon fabrics to create high-performance, highly durable, multifunctional, hierarchical hybrid structural composites. The metallic nanostructures such as nanowires usually exhibit ultra-high strength, but low tensile ductility (i.e., tensile strain to fracture) owing to their limited strain hardening capability. The low ductility can severely affect the mechanical integrity of the constituent nanostructures in nanomechancial devices and other technological applications. The objective of this proposal is to synergistically integrate experiment and modeling to study the mechanical properties and deformation mechanisms governing the tensile ductility in twinned nanowires.